With Mattis Gone, What Ahead for US-China Military Ties in 2019? Mattis’ successor could cause more turbulence in the U.S.-China relationship. US President Donald Trump’s first appointed secretary of defense, James Mattis, has resigned. Despite the president’s claim on Twitter that Mattis was retiring, his resignation letter makes clear that his departure is effectively one borne of long-term ideological disagreements with Trump and his “America first” foreign policy agenda. The proximal cause, while not stated by Mattis himself, appears to be the Trump’s sudden decision to withdraw U.S. forces from Syria. That decision may also be accompanied by a similar drawdown order for U.S. troops in Afghanistan, where Trump initiated a moderate surge after an August 2017 policy announcement. In Asia, Mattis’ departure will be met with trepidation – particularly among states partnered and allied with the United States. For many of these countries, the defense secretary was seen as a symbol of continuity in American foreign policy. Whatever Trump might have tweeted or uttered during summits, Mattis’ stewardship of the massive U.S. defense bureaucracy would result in predictability. During several trips to US-allied and partnered states since Trump’s inauguration, I even heard half-joking comments from analysts who confessed they prayed for Mattis’ health every night. Whatever Mattis might have done in practice – and he did work to implement uniquely Trumpian policies, like a ban on transgender personnel and the deployment of troops to the US-Mexico border – he was seen in Asia as a marker of continued allied commitment. At the two most recent Shangri-La Dialogues in Singapore, both of which Mattis attended, I was struck by how several attendees took comfort in his use of familiar phrasings of American policy. Each year, Mattis spoke as a “normal” U.S. secretary of defense might, pledging his commitment to a rules-based order, freedom of navigation, and U.S. allies. All of this was naturally in tension with Trump’s own strongly held beliefs about the nature of U.S. alliances as effective protection rackets designed to take advantage of the United States. Perhaps the comfort Mattis gave U.S. allies was a defense mechanism of sorts to rationalize the fundamental chaos that Trump represented as the president, but the view of Mattis as a bulwark was not entirely wrong. In his resignation letter, Mattis goes to lengths to underline his strongly held belief in the importance of U.S. alliances. In Asia, in particular, these represent a massive asymmetric advantage for the United States vis-à-vis a rising China. Mattis’ concerns suggest Trump does not share this view. That has been a well-known fact from the president’s rhetoric, dating back at least to the Republican primaries in early 2016. Given all this, it might be easy to frame Mattis’ departure as a victory for China. After all, Beijing was identified, along with Moscow, as one of the United States’ two great power rivals in the U.S. National Security Strategy and National defence Strategy. However, Mattis’ resignation letter effectively repudiates the main thrust of both those documents – each of which emphasised the role of U.S. alliances. It turns out that, in the end, the American president matters in the U.S. political system. Given what is known of Trump so far, his beliefs have and can be turned into policy, contrary to the more conventional desires of his staff. Mattis may have represented a more conventional school of thought in American foreign policy, but even he saw it fit to resign at Trump’s protracted insistence on a divergent path. The absence of Mattis as a personality in the Trump administration might adversely affect the US-China military-to-military relationship, which is already under considerable strain after the imposition of sanctions on the People’s Liberation Army Equipment Development Department under the Countering America’s Adversaries Through Sanctions Act earlier this year and a near-collision incident in the South China Sea. 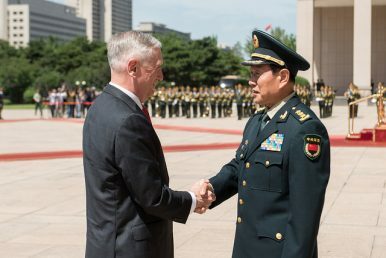 Mattis, though clear on his views towards China, maintained a cordial and working personal relationship with Chinese Central Military Commission Vice-Chairman General Xu Qilang and Defense Minister General Wei Fenghe. It is far from granted that his successor will be able to engage in face-to-face diplomacy with the same candor. The Chinese leadership should remember too that it is entirely possible – and likely – that Mattis’ successor may be equally or more hawkish towards Beijing while lacking a similar wisdom. Given the ongoing downward spiral in US-China relations, a new secretary of defence who shares Trump’s implicit mistrust of China and his most hawkish advisers’ impulses might usher in a more dangerous period. Indeed, Mattis’ parting advice for the president was that he should appoint someone “whose views are more aligned with yours”. If Trump decides to take that advice, the second half of Trump’s presidential term may be set to enter a considerably more disruptive and dangerous space. The 2019 U.S. Missile Defense Review will vindicate longstanding anxieties in China and Russia.